Shopping at Burlington’s City Market/Onion River Co-op just got even more unlike meating up or vegging out at Price Chopper, Hannaford or Shaw’s. The entrances to those suburban chain stores are nondescript at best. Member-owned City Market, by contrast, now greets customers with a skillfully executed, vividly colored mural that melds farming scenes with a stylized Queen Cityscape. Cottony clouds and a gaggle of geese sail by overhead. The still-unnamed mural that wraps around doors and windows is the work of local artist Tara Goreau. Her mockup was chosen from a handful of submissions sent to the co-op last summer in response to a call to artists. Goreau will receive half of the $10,000 allocated for the project, says co-op marketing maven Allison Weinhagen. The prep team that spent days priming and sealing the 25-by-17-foot surface gets the rest, with City Market covering the cost of materials. Loescher’s 10-year-old son, Teddy, is similarly impressed. “There’s a lot going on,” he observes, pointing in particular to paddleboarders stroking along the North Beach shoreline. Goreau painted with exterior latex and applied a protective coat of varnish. “It’s supposed to last 10 years,” she says, while taking a break at a nearby outdoor table on a windy afternoon. The 25-year-old native Vermonter cites Mexican muralists José Clemente Orozco and Diego Rivera as important art-historical influences. More immediate inspiration comes from her father, Peter Goreau, an artist who’s “now more of a poet,” the tall, slender painter relates with a ready smile. Goreau adds that her teachers in high school (St. Johnsbury Academy) and college (Johnson State, after stints at the University of British Columbia and the Design & Arts College of New Zealand) encouraged her inclination to draw on walls. Goreau got started as a professional muralist by offering to beautify blank walls of Northeast Kingdom businesses at no charge to their owners. High Mowing Organic Seeds, a company in Wolcott, and Pete’s Greens, a Craftsbury-based source of organic produce, are consequently graced with early examples of Goreau’s art. Visible to more Vermonters are the sugaring and autumnal scenes she painted last year on the doors of a Jeffersonville barn that faces Route 15. 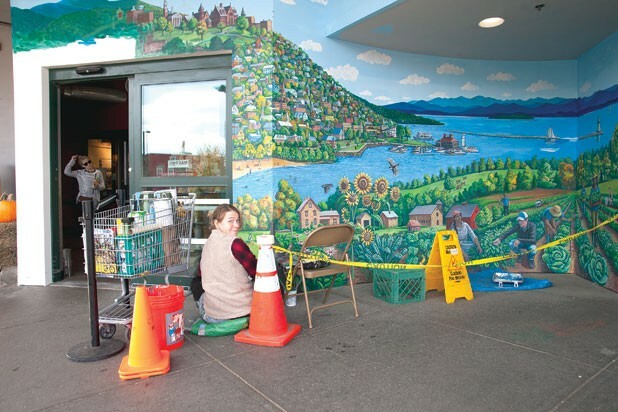 Goreau’s City Market mural occupies one of the highest-traffic spots in Vermont’s largest city. It’s even more of a prime location than the alleyway between Church Street and the Marketplace parking garage, where Québec artist Pierre Hardy painted a hyperrealist mural featuring dozens of local celebrities in 2012. That much larger work, titled “Everyone Loves a Parade!,” causes many visitors to stop, stare and comment. Goreau is not wowed by Hardy’s display of businesses’ logos and beaming sponsors. “Some of us wish a Vermont artist had gotten that job,” she says. But Goreau does acknowledge the strong impact of Hardy’s work. “It does what a mural is supposed to do. It gets people looking and talking about what it shows,” she says. Her own mural is casting that same spell. It doesn’t have the photographic quality of Hardy’s, instead depicting recognizable Burlington locales and vignettes in a spatially mashed-up arrangement. Goreau’s populist approach might remind some viewers of the rollicking work of American artist Red Grooms, although Goreau doesn’t rely on caricatures. A farmer in the Intervale looms large in the lower foreground, for example, while tiny joggers and cyclists pass by above her on the waterfront bike path. Similarly, the hill rising from the lake to the University of Vermont is much steeper in Goreau’s rendering than in reality, but it features several more-or-less properly situated landmarks, including the steeple of the College Street Congregational Church. Goreau says that, in the two weeks before fire destroyed the steeple on October 23, she would check the time on its clock while working on the mural. Goreau’s mural offers an element of historical continuity, too. Weinhagen recalls that a mural of urban ag scenes covered the wall facing the parking lot of the co-op when it was located on North Winooski Avenue in the 1990s. To see more artwork by Tara Goreau, visit arteatergallery.com.